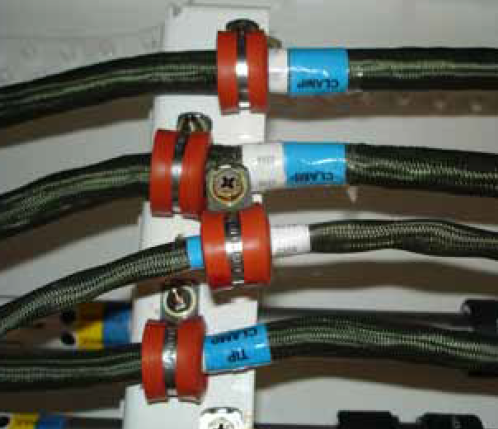 Interconnecting wire is used in point-to-point open harnesses, normally in the interior or pressurized fuselage, with each wire providing enough insulation to resist damage from handling and service exposure. 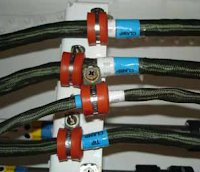 Electrical wiring is often installed in aircraft without special enclosing means. This practice is known as open wiring and offers the advantages of ease of maintenance and reduced weight. Wires are often installed in bundles to create a more organized installation. These wire bundles are often called wire harnesses. Wire harnesses are often made in the factory or electrical shop on a jig board so that the wire bundles could be preformed to fit into the aircraft. 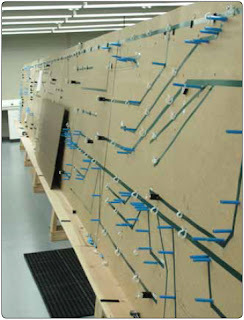 [Figure 1] As a result, each harness for a particular aircraft installation is identical in shape and length. The wiring harness could be covered by a shielding (metal braid) to avoid EMI. Grouping or bundling certain wires, such as electrically unprotected power wiring and wiring going to duplicate vital equipment, should be avoided. Wire bundles should generally be less than 75 wires, or 11⁄2 to 2 inches in diameter where practicable. When several wires are grouped at junction boxes, terminal blocks, panels, etc., identity of the groups within a bundle can be retained. Wiring should be installed with sufficient slack so that bundles and individual wires are not under tension. Wires connected to movable or shock-mounted equipment should have sufficient length to allow full travel without tension on the bundle. Wiring at terminal lugs or connectors should have sufficient slack to allow two reterminations without replacement of wires. This slack should be in addition to the drip loop and the allowance for movable equipment. Normally, wire groups or bundles should not exceed 1⁄2 inch deflection between support points. [Figure 2] This measurement may be exceeded if there is no possibility of the wire group or bundle touching a surface that may cause abrasion. Sufficient slack should be provided at each end to permit replacement of terminals and ease of maintenance; prevent mechanical strain on the wires, cables, junctions, and supports; permit free movement of shock- and vibration-mounted equipment; and allow shifting of equipment, as necessary, to perform alignment, servicing, tuning, removal of dust covers, and changing of internal components while installed in aircraft. Twist the wires so they lie snugly against each other, making approximately the number of twists per foot as shown in Figure 3. Always check wire insulation for damage after twisting. If the insulation is torn or frayed, replace the wire. Splicing is permitted on wiring as long as it does not affect the reliability and the electromechanical characteristics of the wiring. Splicing of power wires, coaxial cables, multiplex bus, and large-gauge wire must have approved data. Splicing of electrical wire should be kept to a minimum and avoided entirely in locations subject to extreme vibrations. Splicing of individual wires in a group or bundle should have engineering approval, and the splice(s) should be located to allow periodic inspection. Many types of aircraft splice connector are available for use when splicing individual wires. 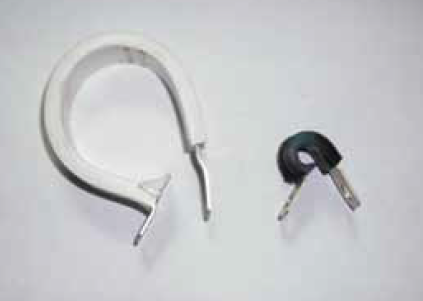 Use of a self-insulated splice connector is preferred; however, a non-insulated splice connector may be used provided the splice is covered with plastic sleeving that is secured at both ends. Environmentally sealed splices that conform to MIL-T-7928 provide a reliable means of splicing in SWAMP areas. However, a noninsulated splice connector may be used, provided the splice is covered with dual-wall shrink sleeving of a suitable material. There should be no more than one splice in any one wire segment between any two connectors or other disconnect points. Exceptions include when attaching to the spare pigtail lead of a potted connector, when splicing multiple wires to a single wire, when adjusting wire size to fit connector contact crimp barrel size, and when required to make an approved repair. 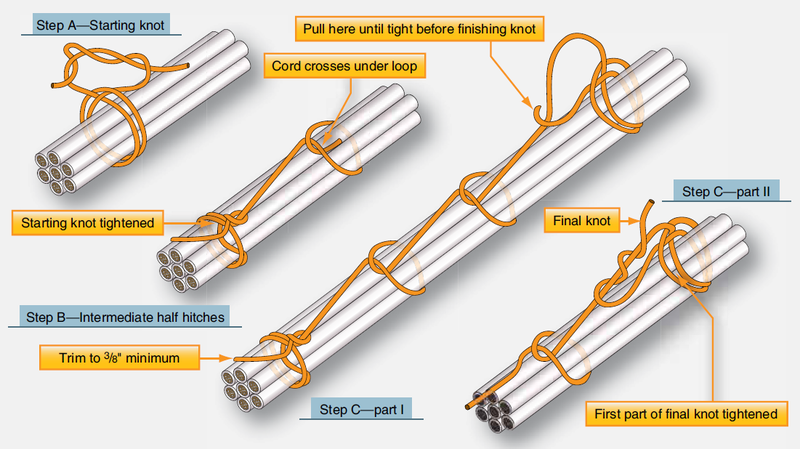 Splices should not be used within 12 inches of a termination device, except when attaching to the pigtail spare lead of a potted termination device, to splice multiple wires to a single wire, or to adjust the wire sizes so that they are compatible with the contact crimp barrel sizes. 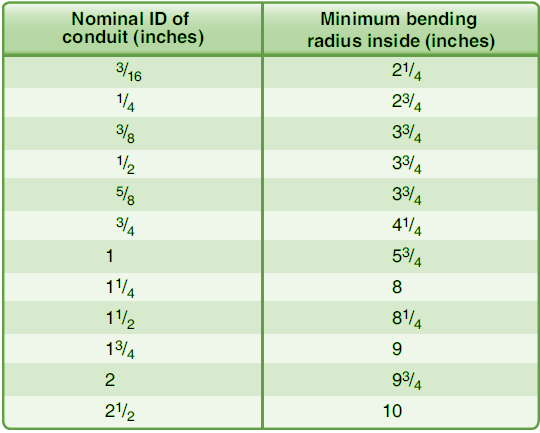 The minimum radius of bends in wire groups or bundles must not be less than 10 times the outside diameter of the largest wire or cable, except that at the terminal strips where wires break out at terminations or reverse direction in a bundle. Where the wire is suitably supported, the radius may be three times the diameter of the wire or cable. Where it is not practical to install wiring or cables within the radius requirements, the bend should be enclosed in insulating tubing. The radius for thermocouple wire should be done in accordance with the manufacturer’s recommendation and shall be sufficient to avoid excess losses or damage to the cable. Ensure that RF cables (e.g., coaxial and triaxial) are bent at a radius of no less than six times the outside diameter of the cable. Wires and wire groups should be protected against chafing or abrasion in those locations where contact with sharp surfaces or other wires would damage the insulation, or chafing could occur against the airframe or other components. Damage to the insulation can cause short circuits, malfunction, or inadvertent operation of equipment. Wiring must be routed away from high-temperature equipment and lines to prevent deterioration of insulation. Wires must be rated so the conductor temperature remains within the wire specification maximum when the ambient temperature and heat rise related to current-carrying capacity are taken into account. The residual heating effects caused by exposure to sunlight when aircraft are parked for extended periods should also be taken into account. Wires, such as those used in fire detection, fire extinguishing, fuel shutoff, and fly-by-wire flight control systems that must operate during and after a fire, must be selected from types that are qualified to provide circuit integrity after exposure to fire for a specified period. Wire insulation deteriorates rapidly when subjected to high temperatures. Separate wires from high-temperature equipment, such as resistors, exhaust stacks, heating ducts, to prevent insulation breakdown. Insulate wires that must run through hot areas with a high-temperature insulation material, such as fiberglass or PTFE. Avoid high-temperature areas when using cables with soft plastic insulation, such as polyethylene, because these materials are subject to deterioration and deformation at elevated temperatures. Many coaxial cables have this type of insulation. An arcing fault between an electrical wire and a metallic flammable fluid line may puncture the line and result in a fire. Every effort must be made to avoid this hazard by physical separation of the wire from lines and equipment containing oxygen, oil, fuel, hydraulic fluid, or alcohol. Wiring must be routed above these lines and equipment with a minimum separation of 6 inches or more whenever possible. When such an arrangement is not practicable, wiring must be routed so that it does not run parallel to the fluid lines. A minimum of 2 inches must be maintained between wiring and such lines and equipment, except when the wiring is positively clamped to maintain at least 1⁄2-inch separation, or when it must be connected directly to the fluid-carrying equipment. Install clamps as shown in Figure 5. These clamps should not be used as a means of supporting the wire bundle. Additional clamps should be installed to support the wire bundle and the clamps fastened to the same structure used to support the fluid line(s) to prevent relative motion. Wires, or groups of wires, should enter a junction box, or terminate at a piece of equipment in an upward direction where practicable. Ensure that a trap, or drip loop, is provided to prevent fluids or condensation from running into wire or cable ends that slope downward toward a connector, terminal block, panel, or junction block. A drip loop is an area where the wire(s) are made to travel downward and then up to the connector. [Figure 6] Fluids and moisture will flow along the wires to the bottom of the loop and be trapped there to drip or evaporate without affecting electrical conductivity in the wire, junction, or connected device. Where wires must be routed downwards to a junction box or electrical unit and a drip loop is not possible, the entrance should be sealed according to manufacturer’s specifications to prevent moisture from entering the box/unit. Wires and cables installed in bilges and other locations where fluids collect must be routed as far from the lowest point as possible or otherwise be provided with a moisture-proof covering. Wires located on landing gear and in the wheel well area can be exposed to many hazardous conditions if not suitably protected. Where wire bundles pass flex points, there must not be any strain on attachments or excessive slack when parts are fully extended or retracted. 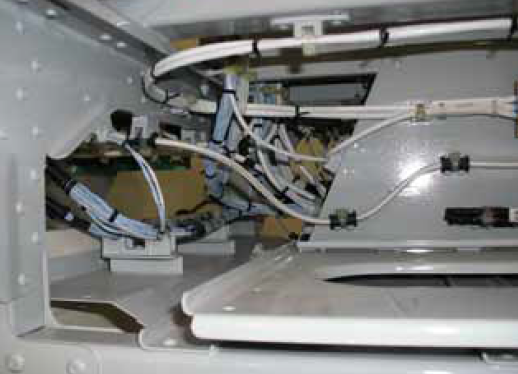 The wiring and protective tubing must be inspected frequently and replaced at the first sign of wear. Wires should be routed so that fluids drain away from the connectors. When this is not practicable, connectors must be potted. Wiring which must be routed in wheel wells or other external areas must be given extra protection in the form of harness jacketing and connector strain relief. Conduits or flexible sleeving used to protect wiring must be equipped with drain holes to prevent entrapment of moisture. The technician should check during inspections that wires and cables are adequately protected in wheel wells and other areas where they may be exposed to damage from impact of rocks, ice, mud, etc. (If rerouting of wires or cables is not practical, protective jacketing may be installed). This type of installation must be held to a minimum. Caution: The use of metal clamps on coaxial RF cables may cause problems, if clamp fit is such that RF cable’s original cross section is distorted. The back of the clamp, whenever practical, should be rested against a structural member. [Figure 10] Stand-offs should be used to maintain clearance between the wires and the structure. 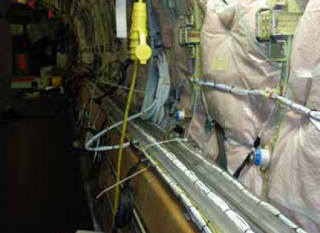 Clamps must be installed in such a manner that the electrical wires do not come in contact with other parts of the aircraft when subjected to vibration. Sufficient slack should be left between the last clamp and the electrical equipment to prevent strain at the terminal and to minimize adverse effects on shock-mounted equipment. Where wires or wire bundles pass through bulkheads or other structural members, a grommet or suitable clamp should be provided to prevent abrasion. When a wire bundle is clamped into position, if there is less than 3⁄8-inch of clearance between the bulkhead cutout and the wire bundle, a suitable grommet should be installed as indicated in Figure 11. The grommet may be cut at a 45° angle to facilitate installation, provided it is cemented in place and the slot is located at the top of the cutout. Inspect wire and cable clamps for proper tightness. Where cables pass through structure or bulkheads, inspect for proper clamping and grommets. Inspect for sufficient slack between the last clamp and the electronic equipment to prevent strain at the cable terminals and to minimize adverse effects on shock-mounted equipment. Wires and cables are supported by suitable clamps, grommets, or other devices at intervals of not more than 24 inches, except when contained in troughs, ducts, or conduits. The supporting devices should be of a suitable size and type, with the wires and cables held securely in place without damage to the insulation. Use metal stand-offs to maintain clearance between wires and structure. Tape or tubing is not acceptable as an alternative to stand-offs for maintaining clearance. Install phenolic blocks, plastic liners, or rubber grommets in holes, bulkheads, floors, or structural members where it is impossible to install offangle clamps to maintain wiring separation. In such cases, additional protection in the form of plastic or insulating tape may be used. 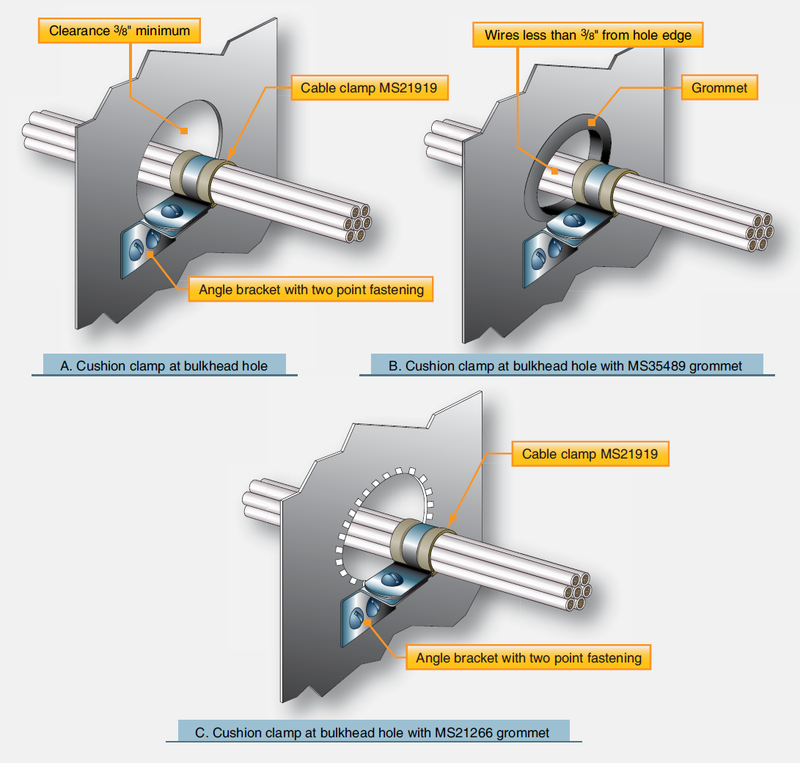 Properly secure clamp retaining bolts so the movement of wires and cables is restricted to the span between the points of support and not on soldered or mechanical connections at terminal posts or connectors. Clamping of wires routed near movable flight controls must be attached with steel hardware and must be spaced so that failure of a single attachment point cannot result in interference with controls. The minimum separation between wiring and movable controls must be at least 1⁄2 inch when the bundle is displaced by light hand pressure in the direction of the controls. Do not locate conduit where passengers or maintenance personnel might use it as a handhold or footstep. Provide drain holes at the lowest point in a conduit run. Drilling burrs should be carefully removed. Support conduit to prevent chafing against structure and to avoid stressing its end fittings. Damaged conduit sections should be repaired to preclude injury to the wires or wire bundle that may consume as much as 80 percent of the tube area. Minimum acceptable tube bend radii for rigid conduit are shown in Figure 13. 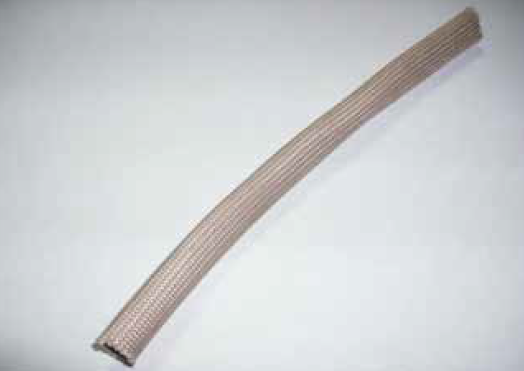 Kinked or wrinkled bends in rigid conduits are not recommended and should be replaced. 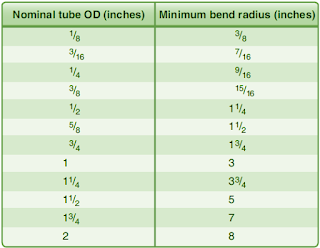 Tubing bends that have been flattened into an ellipse and have a minor diameter of less than 75 percent of the nominal tubing diameter should be replaced, because the tube area has been reduced by at least 10 percent. Tubing that has been formed and cut to final length should be deburred to prevent wire insulation damage. When installing replacement tube sections with fittings at both ends, care should be taken to eliminate mechanical strain. Flexible aluminum conduit conforming to specification MIL-C-6136 is available in two types: Type I, bare flexible conduit, and Type II, rubber-covered flexible conduit. Flexible brass conduit conforming to specification MIL-C-7931 is available and normally used instead of flexible aluminum where necessary to minimize radio interference. Also available is a plastic flexible tubing. (Reference MIL-T-8191A.) Flexible conduit may be used where it is impractical to use rigid conduit, such as areas that have motion between conduit ends or where complex bends are necessary. The use of transparent adhesive tape is recommended when cutting flexible tubing with a hacksaw to minimize fraying of the braid. The tape should be centered over the cutting reference mark with the saw cutting through the tape. After cutting the flexible conduit, the transparent tape should be removed, the frayed braid ends trimmed, burrs removed from inside the conduit, and coupling nut and ferrule installed. 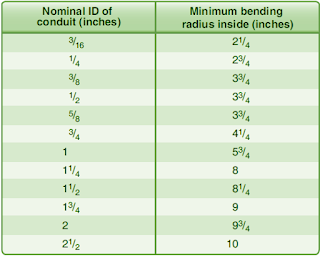 Minimum acceptable bending radii for flexible conduit are shown in Figure 14. One of the more important factors in the design and maintenance of aircraft electrical systems is proper bonding and grounding. Inadequate bonding or grounding can lead to unreliable operation of systems, EMI, electrostatic discharge damage to sensitive electronics, personnel shock hazard, or damage from lightning strike. Grounding is the process of electrically connecting conductive objects to either a conductive structure or some other conductive return path for the purpose of safely completing either a normal or fault circuit. [Figure 16] If wires carrying return currents from different types of sources, such as signals of DC and AC generators, are connected to the same ground point or have a common connection in the return paths, an interaction of the currents occurs. Mixing return currents from various sources should be avoided because noise is coupled from one source to another and can be a major problem for digital systems. To minimize the interaction between various return currents, different types of ground should be identified and used. As a minimum, the design should use three ground types: (1) AC returns, (2) DC returns, and (3) all others. The design of the ground return circuit should be given as much attention as the other leads of a circuit. A requirement for proper ground connections is that they maintain an impedance that is essentially constant. Ground return circuits should have a current rating and voltage drop adequate for satisfactory operation of the connected electrical and electronic equipment. EMI problems that can be caused by a system’s power wire can be reduced substantially by locating the associated ground return near the origin of the power wiring (e.g., circuit breaker panel) and routing the power wire and its ground return in a twisted pair. 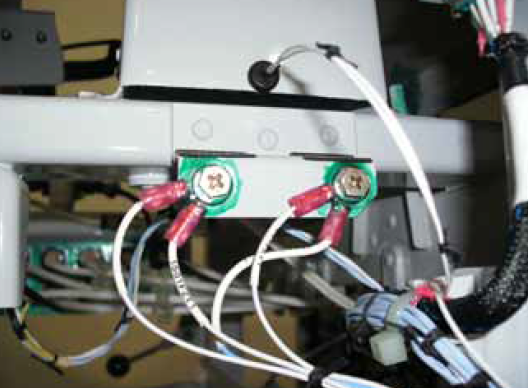 Special care should be exercised to ensure replacement on ground return leads. The use of numbered insulated wire leads instead of bare grounding jumpers may aid in this respect. In general, equipment items should have an external ground connection, even when internally grounded. Direct connections to a magnesium structure must not be used for ground return because they may create a fire hazard. Power ground connections for generators, transformer rectifiers, batteries, external power receptacles, and other heavy-current loads must be attached to individual grounding brackets that are attached to aircraft structure with a proper metal-to-metal bonding attachment. This attachment and the surrounding structure must provide adequate conductivity to accommodate normal and fault currents of the system without creating excessive voltage drop or damage to the structure. At least three fasteners, located in a triangular or rectangular pattern, must be used to secure such brackets in order to minimize susceptibility to loosening under vibration. If the structure is fabricated of a material, such as carbon fiber composite (CFC), that has a higher resistivity than aluminum or copper, it is necessary to provide an alternative ground path(s) for power return current. Special attention should be considered for composite aircraft. Power return or fault current ground connections within flammable vapor areas must be avoided. If they must be made, make sure these connections do not arc, spark, or overheat under all possible current flow or mechanical failure conditions, including induced lightning currents. Criteria for inspection and maintenance to ensure continued airworthiness throughout the expected life of the aircraft should be established. Power return fault currents are normally the highest currents flowing in a structure. These can be the full generator current capacity. If full generator fault current flows through a localized region of the carbon fiber structure, major heating and failure can occur. CFC and other similar low-resistive materials must not be used in power return paths. Additional voltage drops in the return path can cause voltage regulation problems. Likewise, repeated localized material heating by current surges can cause material degradation. Both problems may occur without warning and cause no repeatable failures or anomalies. The use of common ground connections for more than one circuit or function should be avoided except where it can be shown that related malfunctions that could affect more than one circuit do not result in a hazardous condition. Even when the loss of multiple systems does not, in itself, create a hazard, the effect of such failure can be quite distracting to the crew. 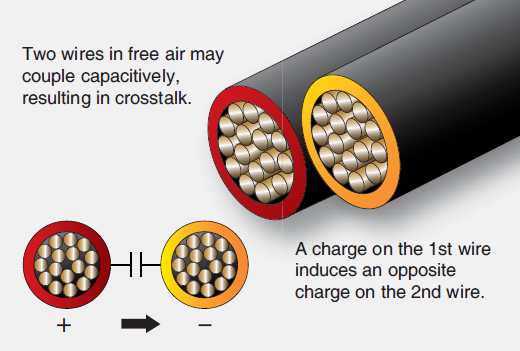 Bonding is the electrical connecting of two or more conducting objects not otherwise adequately connected. Equipment bonding—low-impedance paths to aircraft structure are normally required for electronic equipment to provide radio frequency return circuits and for most electrical equipment to facilitate reduction in EMI. The cases of components that produce electromagnetic energy should be grounded to structure. To ensure proper operation of electronic equipment, it is particularly important to conform the system’s installation specification when interconnections, bonding, and grounding are being accomplished. Metallic surface bonding—all conducting objects on the exterior of the airframe must be electrically connected to the airframe through mechanical joints, conductive hinges, or bond straps capable of conducting static charges and lightning strikes. Exceptions may be necessary for some objects, such as antenna elements, whose function requires them to be electrically isolated from the airframe. Such items should be provided with an alternative means to conduct static charges and/or lightning currents, as appropriate. Static bonds—all isolated conducting parts inside and outside the aircraft, having an area greater than 3 square inches and a linear dimension over 3 inches, that are subjected to appreciable electrostatic charging due to precipitation, fluid, or air in motion, should have a mechanically secure electrical connection to the aircraft structure of sufficient conductivity to dissipate possible static charges. A resistance of less than 1 ohm when clean and dry generally ensures such dissipation on larger objects. 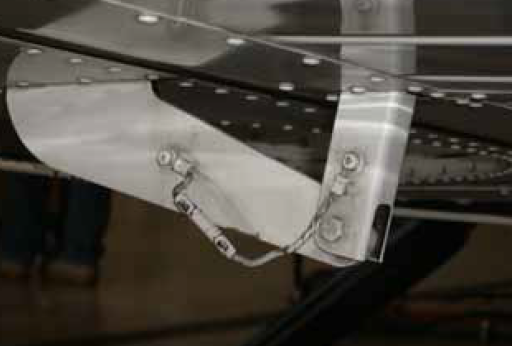 Higher resistances are permissible in connecting smaller objects to airframe structure. The resistance of all bond and ground connections should be tested after connections are made before re-finishing. The resistance of each connection should normally not exceed 0.003 ohm. A high quality test instrument, an AN/USM-21A or equivalent, is required to accurately measure the very low resistance values. Bonding connections—to ensure a low-resistance connection, nonconducting finishes, such as paint and anodizing films, should be removed from the attachment surface to be contacted by the bonding terminal. Electrical wiring should not be grounded directly to magnesium parts. Corrosion protection—one of the more frequent causes of failures in electrical system bonding and grounding is corrosion. The areas around completed connections should be post-finished quickly with a suitable finish coating. Corrosion prevention—electrolytic action may rapidly corrode a bonding connection if suitable precautions are not taken. 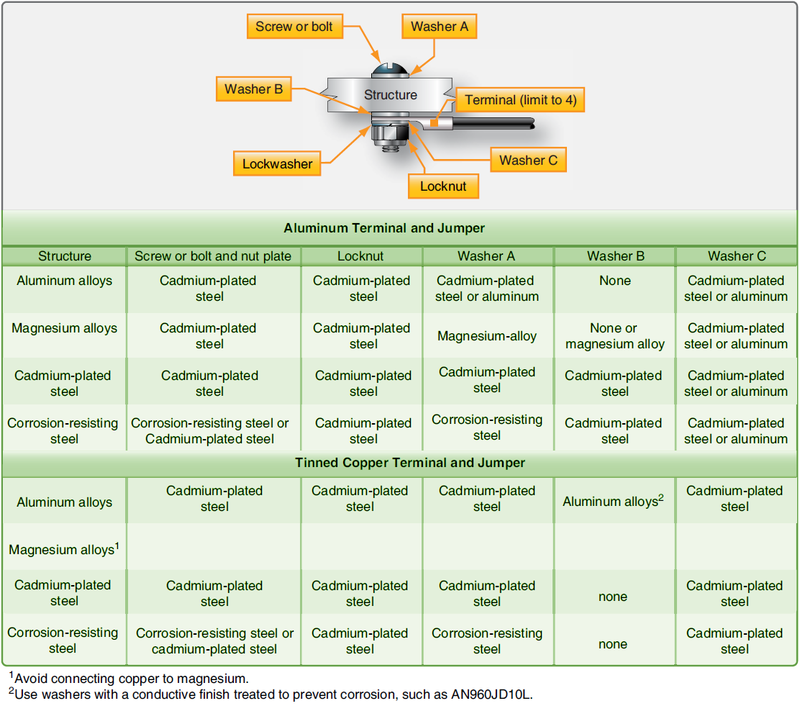 Aluminum alloy jumpers are recommended for most cases; however, copper jumpers should be used to bond together parts made of stainless steel, cadmium plated steel, copper, brass, or bronze. Where contact between dissimilar metals cannot be avoided, the choice of jumper and hardware should be such that corrosion is minimized; the part likely to corrode should be the jumper or associated hardware. Bonding jumper attachment—the use of solder to attach bonding jumpers should be avoided. 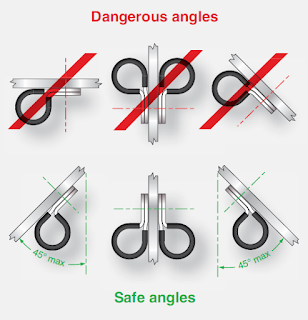 Tubular members should be bonded by means of clamps to which the jumper is attached. 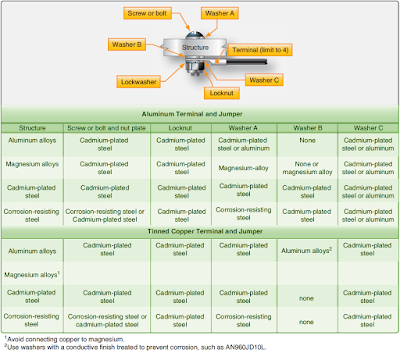 Proper choice of clamp material should minimize the probability of corrosion. Aircraft service imposes severe environmental condition on electrical wire. To ensure satisfactory service, inspect wire annually for abrasions, defective insulation, condition of terminations, and potential corrosion. Grounding connections for power, distribution equipment, and electromagnetic shielding must be given particular attention to ensure that electrical bonding resistance has not been significantly increased by the loosening of connections or corrosion.